It was very difficult for us to see our elder daughter, Suswati suffering. 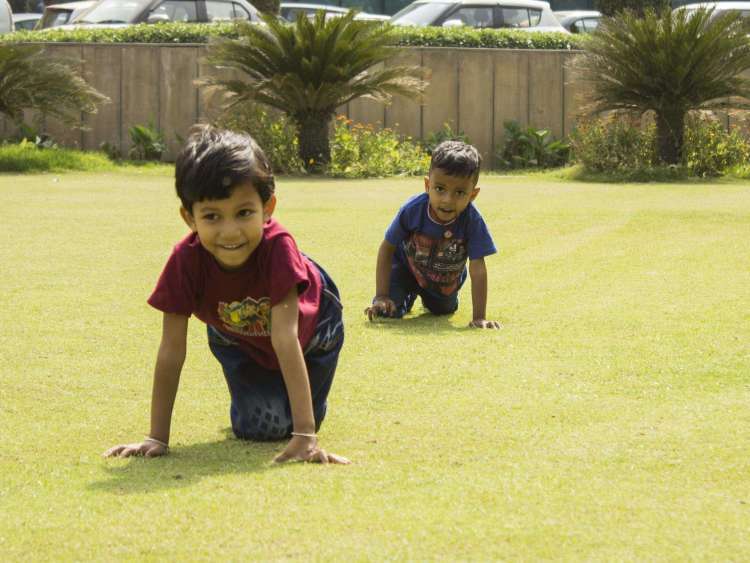 We had thought our younger child would be the strength for the elder one. But now, both of them are suffering. What parent would want such a painful fate for their children? My husband Satyendranath works as a helper in a small company in Delhi. His income would have been enough for a living only if both my children were not sick. As parents, we wanted to give our children the best of everything. But right now even their life is at stake. When I was pregnant with my elder daughter, who is 5-years-old now, I didn’t know she would suffer soon after her birth. At the age of only 4 months, my little girl developed jaundice and recurring fevers. When we took her to the doctors, our worst fears came true. She had thalasemmia major - a terrible, debilitating blood disorder. Having lived all my life in a village, I had heard about thalassemia. But neither Satyendranath nor I was educated enough to know the implications of a disease. 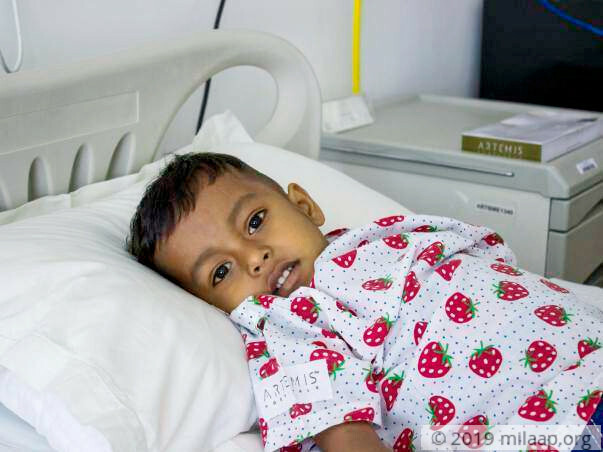 Thalassemia was so common in my village that I never had an idea that it could be such a dangerous terrible condition. Thalassemia is a condition where the body is unable to develop red blood cells (RBC). This means the carrier of oxygen in the blood that is haemoglobin, is absent in the body. When I learnt about the disease from the doctors, I got to know that my little baby had to live on blood transfusions all her life. If she didn’t take regular blood transfusions, not only she can fall sick and breathless, but also can die. Even with transfusions, we would only prolong her life for a few years. 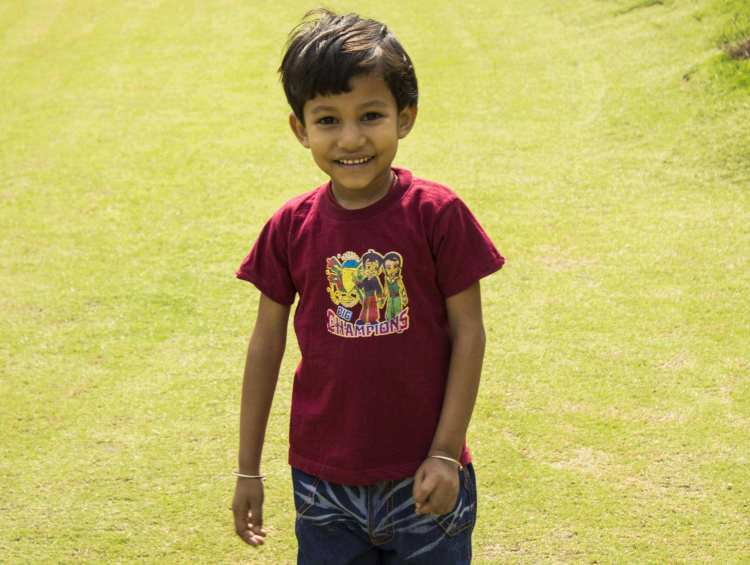 Suswati has been taking blood transfusions since she was 4 months. Now she is 5 years. We have spent a few lakhs by now, but her betterment is only temporary. It is practically impossible for us to carry out the costly blood transfusions and buy medicines every month. We could still have managed if Suawati’s illness is the only thing we had to worry about. When my baby girl was growing up, doctors told us that she could better if she had a bone-marrow transplant after she reached a certain age. They suggested we have another child so her sibling could be a match for the transplant. 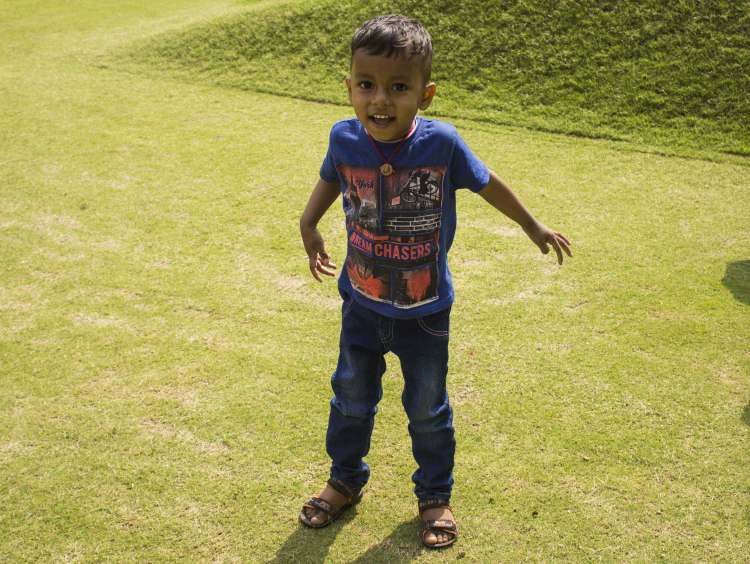 When we found out about thalassemia, we thought we would not have another child. But when the doctor said our other child may cure Suswati - we decided to try again. The reports during my pregnancy all confirmed that he was a healthy baby. We were so relieved. Both our babies would grow up healthy. 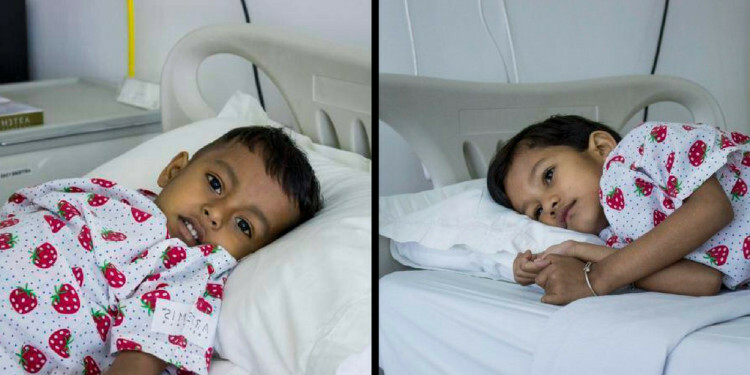 When 7-month-old Arijit also fell sick exactly how it all started with his sister - we were inconsolable. Tests were done on him, he had thalassemia major too. I didn’t know who was to be blamed. In spite of so many precautions, we couldn’t evade the cruelty of destiny. Arijit also needed blood transfusions. I am blessed with such happy and lively children. It is so difficult for us to manage the two kids. Every other minute they will fight. But it is impossible to keep them apart. They are so small but they protect each other. Maybe because they understand each other's pain so much better than us. My little girl loves going to school. But she often has to miss schools because there are days when it is difficult for her to get up from the bed. 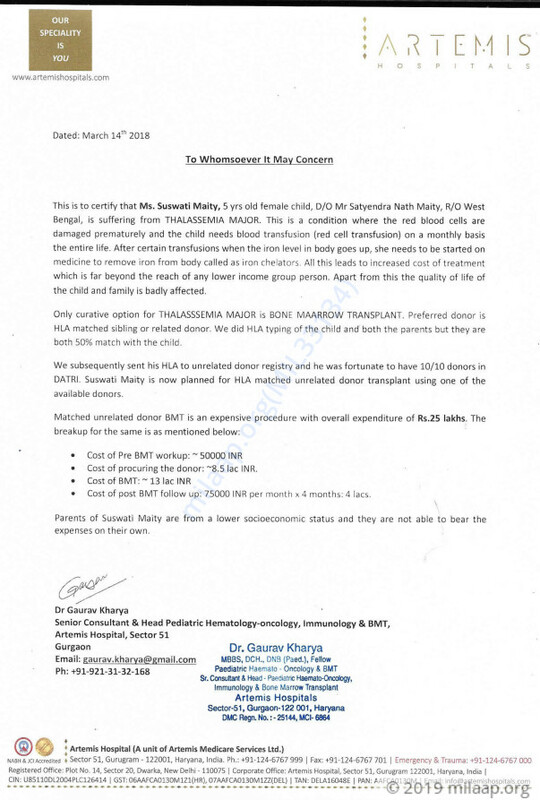 She needs an urgent bone marrow transplant to live. My baby boy is playschool now. 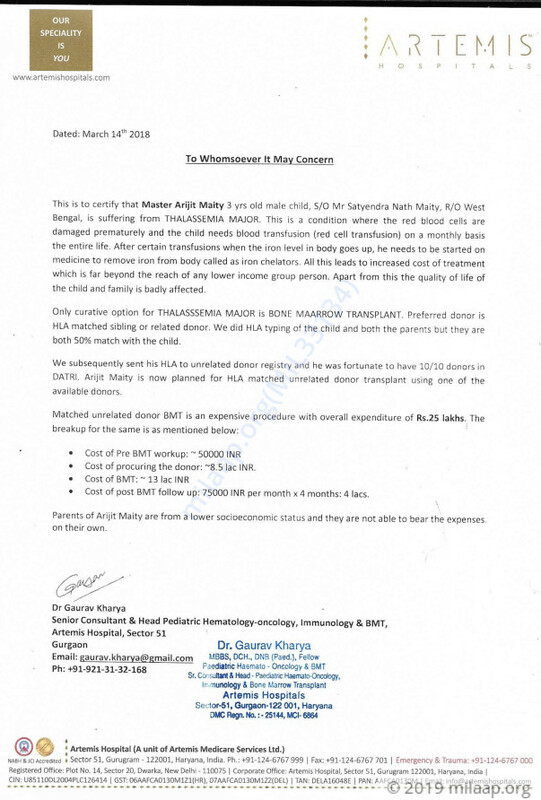 His liver is already affected and he needs and urgent transplant. Since Suswati was born, we have been spending Rs 5000 every month. Every three months we have to spend Rs 40,000 on each one of them. We have lost count of how much we have spent until now. Besides the daily expenses, the increasing expenses of medicines and tests are impossible for us to bear. My husband sometimes has to send money back home. We have already borrowed a lot from our friends and my husband’s colleagues. My husband also has taken loan from his office. His salary is deducted by a certain amount every month, this makes bearing expenses all the more difficult. 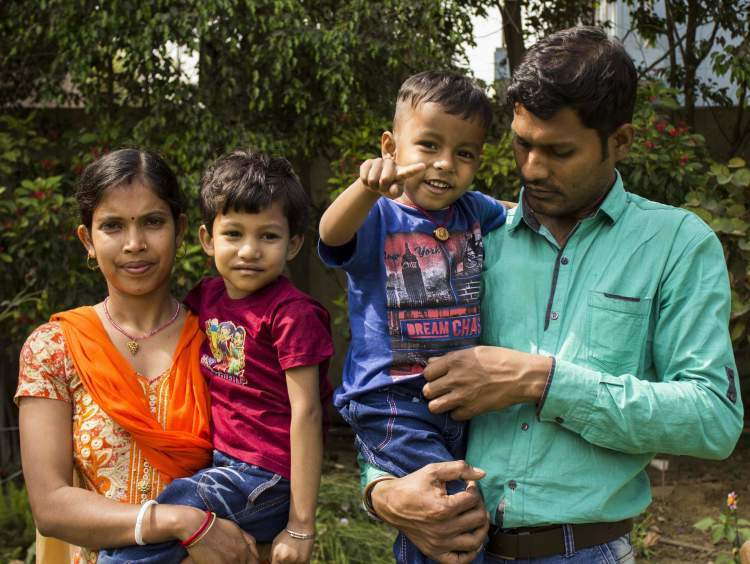 Satyendranath and I thought that we could both work and support our family. But if I go out, there’s nobody to take care of my children. They are too small to take care of themselves. I am also not educated enough to get a good enough job. None of our families have the money to help our children live. We had dreamt of giving our children better education so that they could be successful. But right now we just want them to live. My two children have been suffering for a long time. Blood transfusions are no longer enough to sustain them. Both of them need a bone marrow transplant. 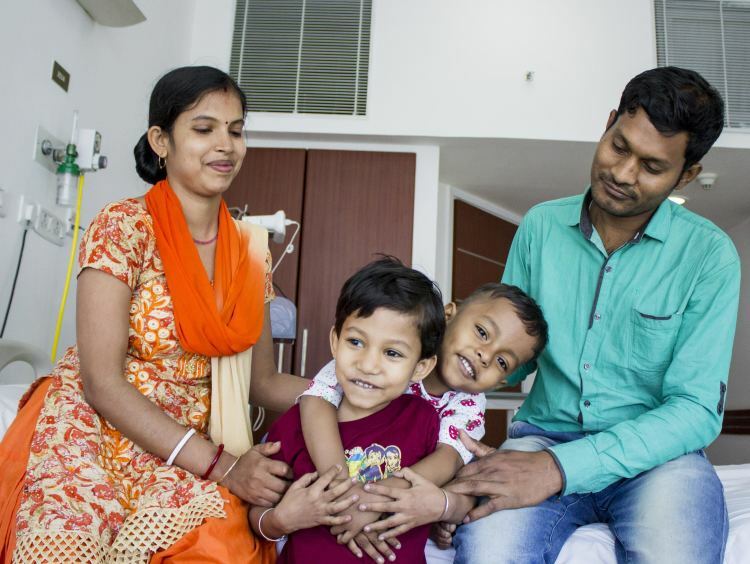 The cost of transplant for each one of them is Rs 25 lakhs, which amounts to Rs 50 lakhs. We have no means left to arrange such huge amount in time. Only your support can help my babies live.